Dinosaurs are a creative way to spice up your next party. Consist of 12 small dinosaurs and a tree. They makes it very easy to create special desserts without being a professional. 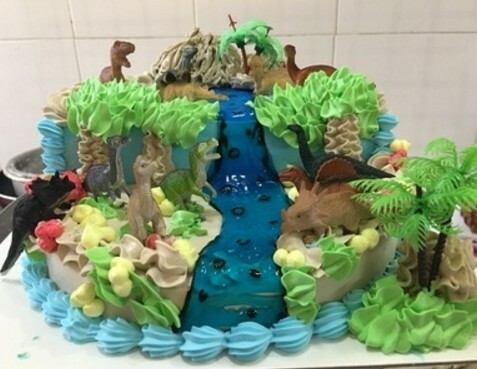 The dinosaurs are about 3cm tall and 5cm width, tree 8cm tall, they can be use for small cake or cupcake decoration. The cake/cupcake deco is going to make your next party a big success because your friends will be talking about it for a long time. This is as EASY as it gets... buy a frosted cake or prepare your own... add the cake toppers. The Cake Photo is just an sample way to decorate the cake. Let your imagination create your own special frosting colors. Using this cake topper automatically and quickly decorates the cake to the glee of the birthday child and all the guests. The decorated cake can then be used as a centerpiece or table decoration!